The Crespi Collection is a remarkable assortment of many thousands of artefacts gathered together by the late Father Carlos Crespi Croci (1891-1982), an Italian Salesian monk who did missionary work among the natives of Cuenca, Ecuador. The collection of objects includes gold, silver and a variety of alloys together with ceramics and tablets with unusual writing. The local Indians who allegedly found them in subterranean caves brought these goods to him. There is no doubt that Fr. Crespi knew that some of the artifacts offered to him were modern, made by locals who were able to get a little bit of charitable assistance while preserving their dignity. Father Crespi never properly catalogued them and over time a number of items were apparently stolen. At present some of these artefacts are stored in the church of Maria Auxiliadora in Cuenca. The caves referred to were apparently located by the late Juan Moricz in 1965. *Erich von Däniken wrote about the caves and Moricz in one of his fantasy books, Gold of the Gods. A somewhat eccentric website(a) from Stanley Hall expands on the story but without any real supportive proof. Among the collection is what appears to be a parapegmata or calendar of a type developed in Greece in the 5th century BC. Many wild claims have been made about this strange assortment, including a link with Atlantis. Richard Wingate devoted a large section of his book, The Lost Outpost of Atlantis, to the Crespi Collection. It was over twenty year later that Wingate again wrote at length about Crespi in his 2011 book, Atlantis in the Amazon. He describes how Crespi had much of his collection taken from him and recounts his last meeting with Fr. Crespi shortly afterwards, leading me to wonder why it took nearly thirty years to record this story. 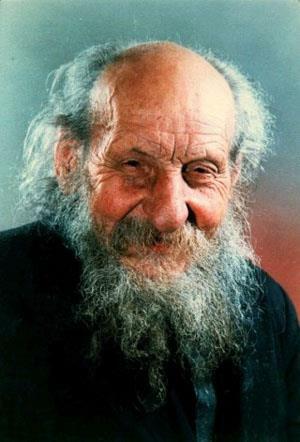 Nevertheless, a 2015 blog from Jason Colavito(b) offers evidence that the objects in question were fakes and that the elderly Father Crespi was unable to distinguish between tin and silver or brass and gold. He also recounts how Erich von Däniken exploited Crespi’s ‘collection’ and fraudulently claimed to have visited the caves mentioned by Juan Moricz in Gold of the Gods. In 2016, April Holloway on the Ancient Origins website(c) offers further evidence that most of the objects purporting to be of trans-oceanic origin or influence are fakes. However, while I fully accept that most of the objects are fakes, there are a few that are more difficult to explain. One of these(d) is so remarkably like a Roman parapegma, that I find difficult to casually dismiss it! In a follow-up to Holloway’s article, Ancient Origins co-founder, Dr Ioannis Syrigos, decided to investigate further into the matter of gold artifacts missing from the collection shown to Holloway. He reports that he was met with obfuscation and threats(e). Commenting on Syrigos’ report, Jason Colavito has suggested that the missing gold pieces were a consequence of corruption or greed rather than conspiracy(f). The Concentric Rings or other architectural features extracted by artists from Plato’s description of the capital of Atlantis have continually fascinated students of the story and many have attempted to link them with similar ancient features found elsewhere in the world as evidence of a widespread culture. Stonehenge, Old Owstrey, Carthage and Syracuse have all been suggested, but such comparisons have never been convincing. 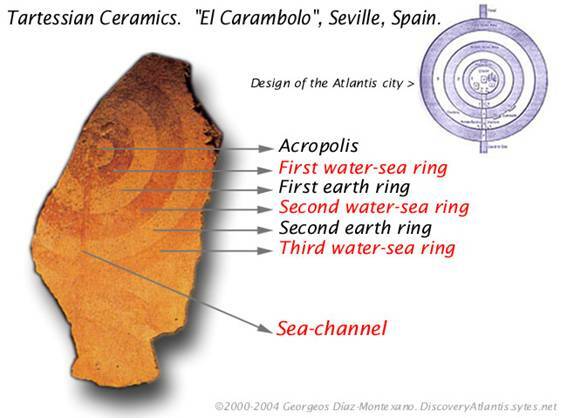 Diaz-Montexano has recently published(a) an image of a fragment of pottery found near Seville in Spain that shows concentric circles and insists that it is a symbol of Atlantis. Ulf Erlingsson has made a similar claim regarding some concentric circles carved on a stone basin found at Newgrange in Ireland. Less well-known are the concentric stone circles that are to be found on the island of Lampedusa in the Strait of Sicily(b). In 1969 two commercial pilots, Robert Brush and Trigg Adams, photographed a series of large concentric circles in about three feet of water off the coast of Andros in the Bahamas. Estimates of the diameter of the circles range from 100 to 1,000 feet. Apparently, these rings are now covered by sand. It is hard to understand how such a feature in such very shallow water cannot be physically located and inspected. Richard Wingate in his book estimated the diameter at 1,000 yards. However, the rings described by Wingate were apparently on land, among Andros’ many swamps. Two papers presented to the 2005 Atlantis Conference on Melos describe how an asteroid impact could produce similar concentric rings, which if located close to a coast could be converted easily to a series of canals for seagoing vessels. The authors, Filippos Tsikalas, V.V. Shuvavlov and Stavros Papamarinopoulos gave examples of such multi-ringed concentric morphology resulting from asteroid impacts. Not only does their suggestion provide a rational explanation for the shape of the canals but would also explain the apparent over-engineering of those waterways. At the same conference the late Ulf Richter presented his idea, which also suggests that the concentric rings around the centre of the Atlantis capital had a natural origin. Richter has proposed that the Atlantis rings were the result of the erosion of an elevated salt dome that had exposed alternating rings of hard and soft rock that could be adapted to provide the waterways described by Plato. Georgeos Diaz-Montexano has suggested that the ancient city under modern Jaen in Andalusia, Spain had a concentric layout similar to Plato’s description of Atlantis. In August 2016 archaeologists from the University of Tübingen revealed the discovery(i) of a Copper Age, Bell Beaker People site 50km east of Valencina near Seville, where the complex included a series of concentric earthwork circles. Jim Allen in his latest book, Atlantis and the Persian Empire, devotes a well illustrated chapter to a discussion of a number of ‘circular cities’ that existed in ancient Persia and which some commentators claim were the inspiration for Plato’s description of the city of Atlantis. These include the old city of Firuzabad which was divided into 20 sectors by radial spokes as well as Ecbatana and Susa, both noted by Herodotus to have had concentric walls. Understandably, Allen, who promotes the idea of Atlantis in the Andes, has pointed out that many sites on the Altiplano have hilltops surrounded by concentric walls. However, as he seems to realise that to definitively link any of these locations with Plato’s Atlantis a large dollop of speculation was required. Dale Drinnon has an interesting article(d) on the ‘rondels’ of the central Danubian region, which number about 200. Some of these Neolithic features have a lot in common with Plato’s description of the port city of Atlantis. 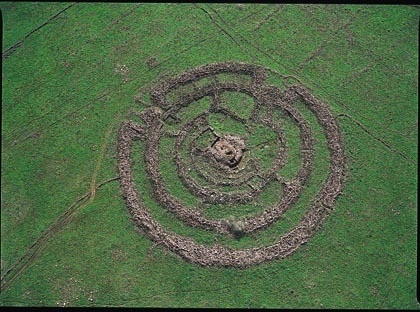 The ubiquity of circular archaeological structures at that time is now quite clear, but they do not demonstrate any relationship with Atlantis. The late Marcello Cosci based his Atlantis location on his interpretation aerial images of circular features on Sherbro Island, but as far as I can ascertain this idea has gained little traction. One of the most remarkable natural examples of concentric features is to be found in modern Mauritania and known as the Richat Structure or Guelb er Richat. It is such a striking example that it is not surprising that some researchers have tried to link it with Atlantis. Robert deMelo and Jose D.C. Hernandez(o) are two advocates along with George S. Alexander & Natalis Rosen who were struck by the similarity of the Richat feature with Plato’s description and decided to investigate on the ground. Instability in the region prevented this until late 2008 when they visited the site, gathering material for a movie. The film was then finalised and published on their then newly established website in 2010(l), where the one hour video in support of their thesis can be freely downloaded(m). 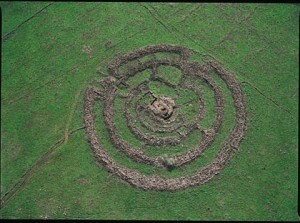 In 2008, George Sarantitis put forward the idea that the Richat Structure was the location of Atlantis, supporting his contention with an intensive reappraisal of the translation of Plato’s text(n). He developed this further in his Greek language 2010 book, The Apocalypse of a Myth with an English translation currently in preparation. However, Ulf Richter has pointed out that Richat is too wide (35 km), too elevated (400metres) and too far from the sea (500 km) to be seriously considered as the location of Atlantis. Brad Yoon has claimed that concentric circles are proof of the existence of Atlantis, an idea totally rejected by Jason Colavito(j). This obsession with concentricity has now extended to the interpretation of ancient Scandinavian armoury in particular items such as the Herzsprung Shield(c). In 2011 Shoji Yoshinori offered the suggestion that Stonehenge was a 1/24th scale model of Atlantis(f). He includes a fascinating image in the pdf. For my part, I wish to question Plato’s description of the layout of Atlantis’ capital city with its vast and perfectly engineered concentric alternating bands of land and sea. This is highly improbable as the layout of cities is invariably determined by the natural topography of the land available to it(h). Plato is describing a city designed by and for a god and his wife and as such his audience would expect it to be perfect and Plato did not let them down. I am therefore suggesting that those passages have been concocted within the parameters of ‘artistic licence’ and should be treated as part of the mythological strand in the narrative, in the same way that we view the ‘reality’ of Clieto’s five sets of male twins or even the physical existence of Poseidon himself. Furthermore, Plato was a follower of Pythagoras, who taught that nothing exists without a centre, around which it revolves(k). A concept which may have inspired him to include it in his description of Poseidon’s Atlantis. 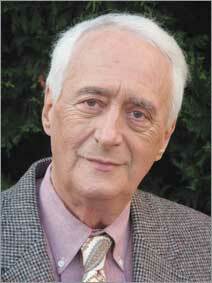 Lost Outpost of Atlantis  was written by Richard Wingate, is now out of print. The book endeavours to offer evidence for the view that the Caribbean and South America were colonised by Atlantis. Wingate travelled to Cuenca in Ecuador on four occasions to study the “Crespi Collection“, named after an Italian missionary, Father Crespi. This remarkable collection of artefacts, fashioned in various materials including gold, silver, copper and stone, seemingly showing Egyptian, Phoenician or Abyssinian influences. 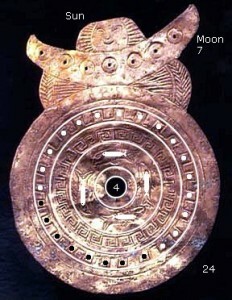 None of the 7,000 objects indicate any link with the local Incan or Mayan cultures. Wingate also explores the Ecuadorian capital Quito with an eye for the anomalous. He has an interesting chapter on the Bahamas in general and Bimini in particular. He relates how many tons of dressed granite has been salvaged from sea floor structures, which is somewhat reminiscent of the recycling of the granite facing stones from the Great Pyramid and other ancient constructions. However, independent proof of this local re-use is lacking. The book contains the full text of Plato’s Timaeus and Critias relating to Atlantis. Apparently, this is the only book written by Wingate. Andros Island is the largest of the Bahamas Islands, where, since the late 1960’s there have been a number of underwater sightings and discoveries that have generated regular speculation that the area is home to remnants of Plato’s Atlantis. In 1969 two commercial pilots, Robert Brush and Trigg Adams, photographed a series of large concentric circles in about three feet of water off the coast of Andros. Estimates of the diameter of the circles range from 100 to 1,000 feet. 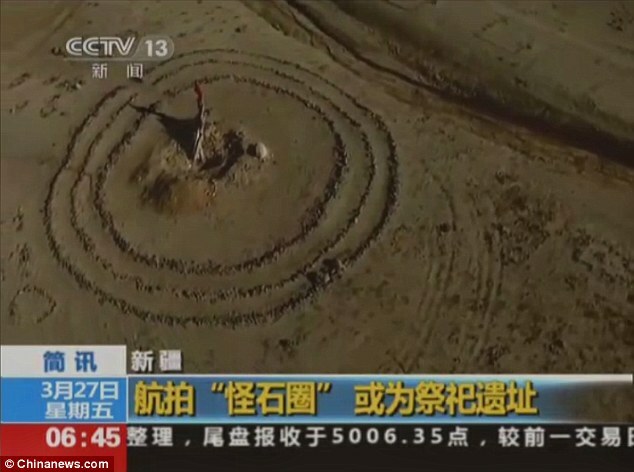 Apparently, these rings are now covered by sand. It is hard to understand how such a feature in such very shallow water cannot be physically located and inspected. Richard Wingate in his book estimated the diameter at 1,000 yards. However, the rings described by Wingate were apparently on land, among Andros’ many swamps. During the 2003 A.R.E. ‘Search for Atlantis Expedition’ an unexpected three tiered structure was discovered off Andros near Nicholls Town at the north of the island. It was approximately 150 feet by 450 yards. It was composed of blocks about 25x30x2 feet. Other features were discovered and more searches are planned. The Littles believe that these structures could only have been built around 8000 BC, but if this were true they would be in much deeper water rather than the 10-30 feet reported as the change in sea levels has been some hundreds of feet since 8000 BC. The A.R.E. reports are to be found on their website(a) and in greater detail in a book by the husband and wife team of Gregory & Lora Little. Further investigations were carried out in 2004 and continue today. Richard Wingate (1933-2011) was described by Andrew Collins as a ‘maverick mineral prospector and explorer’(a). His search for Atlantis brought him to Ecuador where he was enchanted by the so-called Crespi Collection leading him to speculate on a possible link between it and lost Atlantis. 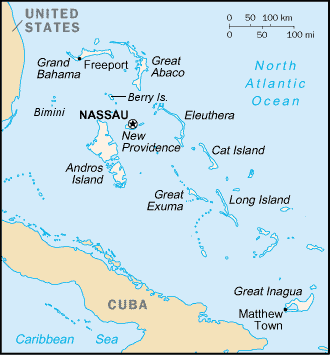 He subsequently shifted his attention to the Bahamas where he claimed to have discovered Atlantean structures in shallow waters. He detailed his discoveries in his first book. Wingate published his second book, Atlantis in the Amazon in June 2011. In it he returned to a further consideration of the Crespi Collection and its place in the theory of a South American/Caribbean Atlantis. In support of his view of Atlantis he invoked the controversial Oera Linda Book, Annie Besant, the English theosophist and of course Edgar Cayce. He also discussed ‘ancient technologies’, including his most startling claim, that Atlantis was destroyed by a prehistoric nuclear war between the Aryans and the Atlanteans. He speculates that the Athenian army was destroyed when a Gibraltar landbridge was shattered by earthquakes allowing the Atlantic to flow in, swamping the Hellenes! Minor details overlooked by Plato! Wingate originally put Atlantis in the Bahamas, but now he entitled his second book as Atlantis in the Amazon and ends up with Atlanteans being involved in nuclear war in ancient India. Along the way we have metallic glue, Easter Island, Indian wooden flying machines and ancient lasers. All very confusing, to say the least. Wingate’s ancient atomic weapons claim is just a rehash of the wild speculation from the 1940’s(e) followed by that of Pauwels and Bergier in the 1960’s and regularly regurgitated ever since(b). Contrast the last link and Wingate’s remarks with the more forensic analysis of Jason Colavito(c) together with Dale Drinnon’s account(d).